In the face of such proof, the disciples “were still incredulous [apisteō – lit. not trusting, not believing] for joy [charas] and were amazed [thamazontōn].” A little closer to the literal Greek is “While in their joy they were disbelieving and still wondering” (NRSV) – but perhaps more colloquially, “for it seemed too good to be true” (NEB). The other instance of “not believing” (apisteo) in Luke occurs when the women tell the disciples about their experiences at the empty tomb. “These words seemed like nonsense to them, and they did not believe (apisteo) them” (24:11). In the next verse, after Peter has been to the empty tomb, he goes home, “amazed (thaumazo) at what had happened.” Both the empty tomb and, so far, this appearance of Jesus produced only incredulity and amazement – two emotions that seem to get in the way of believing. Jesus next offering of proof is presented with much fewer words and with no response from the disciples. Jesus eats in their presence. However, if we look back to the previous appearance story in Emmaus, we know that Jesus eating with the disciples opened up their eyes to see the truth about Jesus. Bible Study. The second part of the appearance to the eleven and the others looks both backward and forward. Neither the text of the Emmaus Road story or this account provides any hints at the specific OT texts Jesus points to: “in the law of Moses and in the prophets and psalms…”(v.46). As Jesus “opened their minds” this interlude serves both to bring closure to the disciples’ period of “fear” by recapping major themes of the Gospel and setting the stage for the coming of the Spirit and the work of the disciples as witnesses in the book of Acts. Verses 44–46 return to the theme of the necessity of Jesus’ death and the fulfillment of Scripture, while in vv. 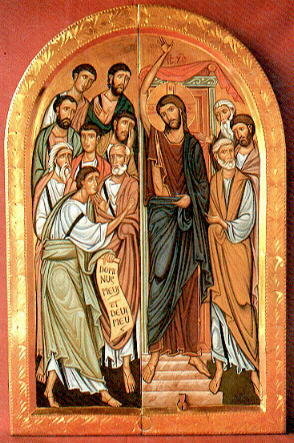 47–49 Jesus commissions the disciples, promises their empowerment from on high, and outlines the mission that lies ahead. There are three parts of his instructions about what has been written. He is to suffer — the messiah. He is to be raised from the dead on the third day. They are to be his witnesses, going in his name to proclaim repentance leading to the forgiveness of sins to all nations, beginning from Jerusalem.